"These are a sweet twist on the usual roasted pumpkin seeds. Instead of salty and savory, they remind me of honey-roasted peanuts. Everyone who tastes these LOVES them!" 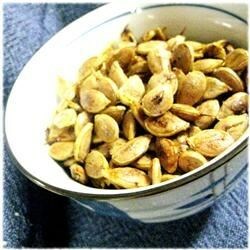 Combine the pumpkin seeds, margarine, brown sugar, cinnamon, and salt in a bowl; stir to coat the seeds. Spread the seeds in a single layer in a 10x15 inch jelly roll pan. Bake in the preheated oven for 15 minutes; stir and return to oven for 15 minutes more; remove from oven and sprinkle 2 tablespoons sugar over the seeds; stir to coat. Return to oven and bake another 15 minutes before removing again to sprinkle with remaining sugar and stirring. Bake another 15 minutes. Allow to cool before serving. Store leftover seeds in an airtight container. Watch how to toast and caramelize pumpkin seeds! Great recipe, thanks! I followed the recipe to a T, except, after reading the reviews, I baked in 7 minute intervals, instead of 15. What a disapointment! They were dripping with margarine and again, mine were burned- and I really watched them. I think the oven temp is too high. Anyway, I won't be wasting my time again.